You'll have to forgive the several photographic failures of this shot - slightly blurred, not centred, tail cut off - and instead appreciate that it got taken at all. This lion, looking straight at me in a very appraising sort of way, was as close as he looks. In fact, closer: after I clicked the shutter, he passed right by where I was sitting in the open Landy, less than two metres from me. 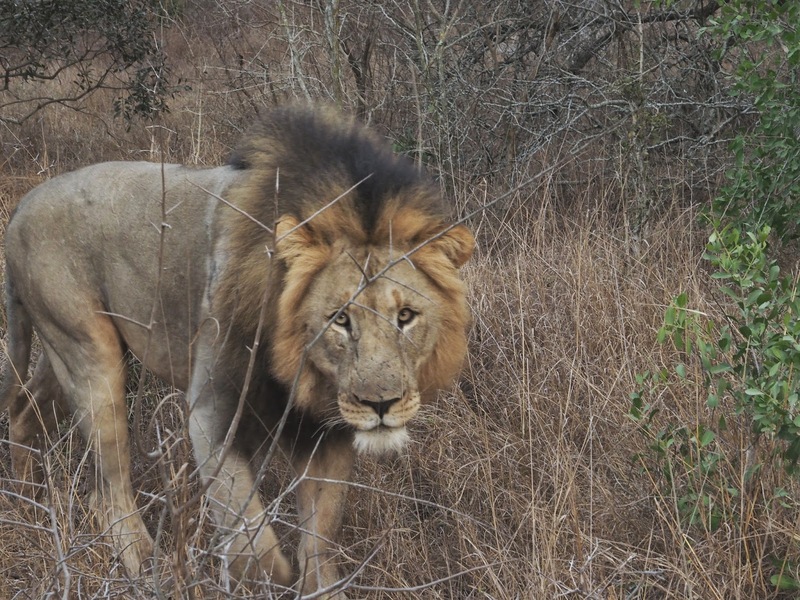 And while that's not rare in the usual run of things at Phinda Private Game Reserve in South Africa, this is a newly-acquired lion and still an unknown quantity. He was so close that had he decided that I was worth investigating as prey (something that vehicles and their contents generally aren't) our ranger Bruce in the driver's seat right in front of me would have had no time to get his gun out and instead would have had to face the lion down, trying to look big, and yelling at him. Apparently this does happen, occasionally - "It's why you sign a disclaimer," we were told cheerfully, afterwards. But this time our close encounter was simply thrilling, and a perfect way to end our too-short stay at Phinda, itself the perfect finish to our rhino crusade to Zululand. This last early-morning game drive was followed by 3 hours on the road to Durban airport, an hour to Joburg, 11 hours to Sydney, and a bit over two hours back to Auckland and home. Plus all the bits in between, that's a long journey, but so very worth it, in every way, and one I'd make again anytime. Africa.